As I said in my last post, I didn't really advertise for graduation photos this year, but I was still hired to do a number of them recently. Isaac found me in a Google search a few months back and we set a date to go onto campus and get them done! I found Isaac to be a really cool guy that's looking forward to graduating and returning to the East Bay. Davis life is a little too slow for him, but to each their own! Glad he's able to return home with his degree! For the most part, I've shot all my graduation photos using available light. UC Davis provides ample amount of shade so that the light is nice and soft. I don't mind using my portable flash units, but shooting natural light allows me to work a lot of faster and deliver more final images to my clients. We had a lot of fun doing the cap toss today. It took many tries to get it right, but the Sony a9 that I use to shoot really helps capture the exact moments I want. I thought this was a nice location to get the cap toss as you can see the prominent UC Davis sign in the background. It's nice to show off the school you are graduating from! Along for the shoot was Isaac's absolutely adorable corgi. He was very patient and followed us around the entire time without and fuss. We couldn't do the shoot without getting him into a few shots! I love how animals have made their way into my grad photoshoots in recent memory. Be it animals from the school or pets, they've been important part of the photographs! Details are where it's at, and I love making sure that I get some details of important items every time I shoot. Here's Isaac nicely blurred out in the background pointing to his 2018 tassel. 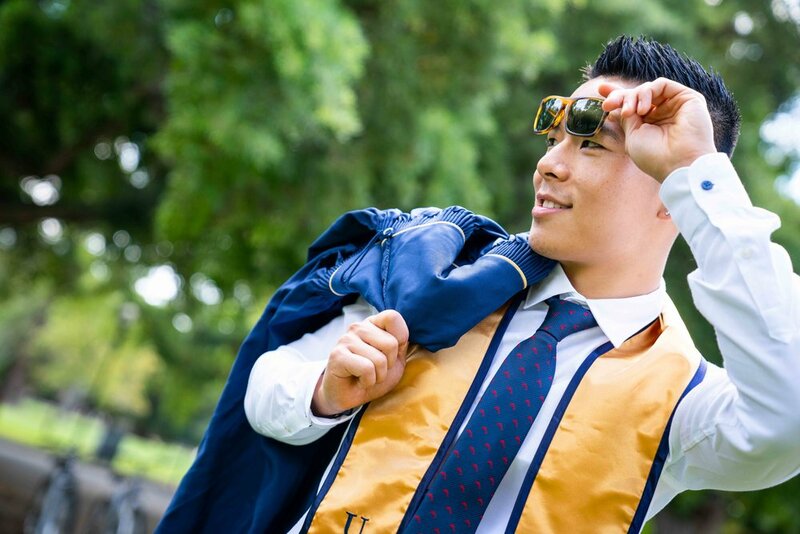 These things, like the cap and UC Davis sign before, create contexts to the photoshoot. Grad photos should really mark a part of life in a specific way. Getting these details is essential to do that. I had a blast shooting with Isaac this week. This final image comes from 'the' UC Davis sign. When we got to this location, the sign and the entire are around it was covered with shade - perfect for even lighting. Sadly, the two groups in front of us took forever to get their sessions done, and by the time we got to the sign it was completely washed in harsh sunlight. We weren't going to let that get in our way. Though the light is certainly not soft, I still think this image came out really nicely! If you're graduating soon and looking to get your photos done, please let me know! I'm here to get you the best and most unique graduation photos possible!